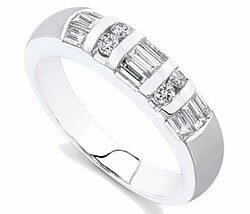 View our wedding rings here. When it comes to marriage can you think of anything more important than your wedding ring? No other piece of jewelry will be as meaningful to you and your spouse than these very important rings. Your wedding ring is the one part of your wedding that will stay with you every day. The decorations, the flowers and the bouquet will not be seen or worn by you all of the time the way your wedding ring will be. When considering what wedding ring to purchase there are some factors that should be taken into account. What kind of metal do you want your wedding ring to be made of? This is generally the first question you will have to deal with. There are different types of metals that are used in the creation of wedding rings but the most common are yellow gold, white gold and platinum. Platinum is the most expensive material that is commonly used followed by yellow gold. One easy way to choose the metal is to look at your other jewelry to see what will match the best. If most of your jewelry is yellow gold then a yellow gold wedding ring is probably your best choice. If you have a lot of silver, a white gold or platinum wedding ring may be a better choice because they are similar in appearance. Finding the right style for your wedding ring is done in a similar manner. What style of clothing do you generally wear? You want to have a wedding ring that shows your personality and matches the style of your clothing. Knowing your jewelry style is very important when it comes to finding wedding rings that are just right for you and your spouse. Not all wedding rings have a stone. This is a personal choice that you will need to make. If you do decide that you would like to have precious stones in your wedding ring, you will have to choose a stone that will be able to survive throughout the years. Diamonds are not only the traditional stone because of their beauty, they are also the hardest stone. This means that you will probably never have to replace a diamond throughout your wedded life. If you were to choose a softer stone then it may get damaged by everyday wear. These are the types of things that need to be considered when choosing the wedding rings that are right for you and your partner. Deciding on the jeweler that you want to make your wedding rings is another important decision that you will need to make. At Novori, we take pride in our wide selection of wedding rings and our excellent customer service. You can browse through our selection online in the comfort of your home with your spouse and save yourselves a lot of time and stress. If you need any assistance or if you want to have your rings custom made, one of our staff will be more than happy to assist you in creating your perfect wedding ring.